Investment has proven to be a big game changer. 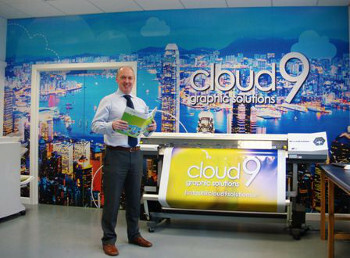 Cloud 9, Managing Director, Peter Carroll with Roland SP-540i It has been just over a year since Dublin based, Cloud 9 Graphic Solutions, a traditional lithograph printer, made the decision to enter the wide format digital printing market. In November 2011, Cloud 9, purchased a Roland SP-540i from Sign+Digital and in the words of Peter Carroll, Owner and Managing Director at Cloud 9, the decision has been a complete ‘game changer’ for the business. Sign+Digital market the Roland VersaCAMM SP-540i as an easy-to-use machine, producing superior print quality on a wide variety of applications. Available in both 30”and 54”models, it comes with a low initial investment and is sold as the ideal entry level model for graphics professionals and commercial printers. Sign+Digital logo Cloud 9 Graphic Solutions purchased the Roland SP-540i from Sign+Digital who are a Roland Authorised Dealer for all Roland large format digital printing equipment in Ireland. Their Creative Centre in Tallaght, Dublin has a purpose built Roland showroom where you can view a full demonstration on all Roland large format printers. The company also supply a wide range of sign supplies, digital media, tools and display products to the sign making and digital printing trade.